AFC Leader, Attorney-at-Law Khemraj Ramjattan was appointed Second Vice President and Minister of Public Safety, formerly the Ministry of Home Affairs. Noel Holder is now the Minister of Agriculture, while Sydney Allicock is Minister of Indigenous Peoples Affairs. Under the previous administration this was the Ministry of Amerindian Affairs. Valerie Garrido-Lowe will serve as Minister within that Ministry. Joining Finance Minister, Winston Jordan will be member of the Justice for All Party, Jaipaul Sharma who will serve as Minister within the Finance Ministry. On the other hand, Keith Scott has been added as a Minister to the Ministry of Communities, with responsibilities for housing. It was revealed that Dawn Hastings is to be sworn in as Minister within the Ministry of Communities. Shortly after each Minister took the oath of office the President challenged them to help the government to effectively execute its mandate to improve the lives of the Guyanese people. 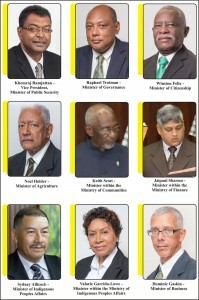 Granger promised efficiency and transparency from the new Cabinet. “I feel honoured; I feel proud to have behind me a group of men and women who are going to transform Guyana and see that we have a good life for all Guyanese,” the President said. He expressed hope that in the next five years the Guyanese people will be satisfied with the work of his administration. Already, the government has received some criticisms for the choice of more “mature” Ministers but Granger emphasised the need for experience. “We need the experience. 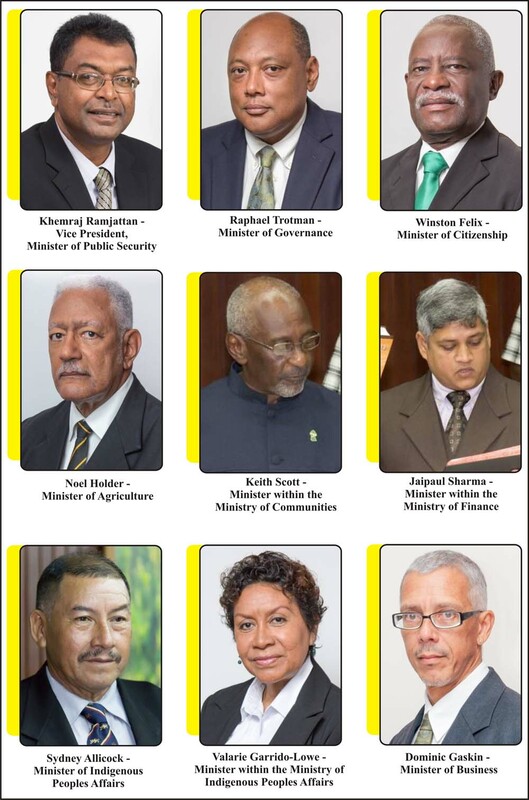 There are only two persons in the entire Cabinet who have had the Cabinet experience and we need to ensure that persons who have had experience in other fields are in positions to lead those Ministries,” Granger said. The President told members of the media that there are a significant numbers of junior Ministers positioned to understudy those with experience. “What you are seeing now is not what will exist a few years from now. We have a lot of young ministers,” he said. The cabinet was one selected not only to ensure the government’s work is done but also to provide an apprenticeship for the younger ministers, he added. Explaining the formation of the new Ministries, Granger noted that Ministry of Citizenship is one that will deal with immigration, naturalization, registration and the status of persons who are citizens of Guyana. Granger said that it is imperative that there should be a registration process that will ensure that that child’s registration continues up until the time of death. “We are aware of persons coming into the country seem to be getting access to Guyanese citizenship very easily and we want to ensure that citizenship remains a prize that is protected by the State and we are going to be more efficient and that is why a special Minister had to be appointed,” the President explained. Granger emphasised that citizenship is very important, not only for voting but also to ensure that the rights of the people are protected. The Ministry of Governance, the President explained, will seek to improve the quality of governance in the country; particularly the observance of constitutional provisions, the convening of a Commission to reform the Constitution and to ensure that there is stricter application of Article 13 of the Constitution which calls for inclusionary governance. The Ministries of Governance as well as Citizenship will be housed in the Ministry of the Presidency, he said. Even though a number of Ministries have been absorbed including Culture Youth and Sport which now comes under the Ministry of Education, the staff for that Ministry along with the Ministry of Natural Resources will be retained to perform their functions, the President explained. Who is the Permanent Secretary of the Ministry of Citizenship?